While you guys are still flexing the MTN free browsing cheat with Spark VPN, HTTP injector and KPNTunnel VPN, I have decided to add one more VPN to the list and this time it's Eproxy. The Eproxy VPN App is also very fast and it powers all Apps, but just like the HTTP Injector it doesn't work on rooted Android phones. So if your phone is rooted then you might want to try out Spark VPN or KPNTunnel Rev instead. 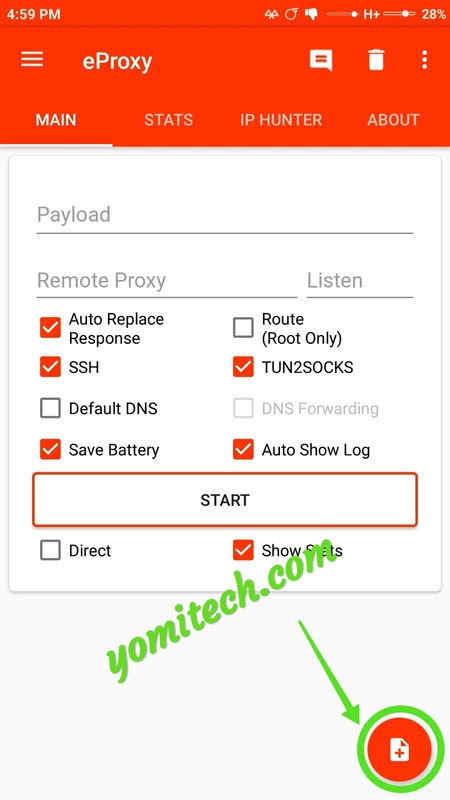 Below is the full procedure on how to setup the Eproxy VPN for MTN browsing cheat. ** Your non rooted Android phone. ** MTN SIM (with no active data plan). ** Eproxy VPN App. Download it HERE or HERE. >> Download and install the Eproxy VPN app from this LINK. >> Download the config file from this LINK. >> Launch the eProxy App and click on the Plus icon at the bottom right corner of the screen. >> Locate the config file you downloaded earlier and select it. >> Click on Start and wait for a few seconds for the VPN App to connect. Note: The free data is capped at 1GB per day for each SIM. Once you exhaust the daily 1GB, you will have to wait till 12am for another one. Also, if you find this post helpful, then don't forget to share it with your friends. I tried to start my eproxy but its asking for PayLoad,remote proxy. what will I do? Wanted to join your group on WhatsApp but it says the link has been revoked.